Fun fact #458 about me: I love clothing. And I’m not talking about the usual retail therapy binge at the change of the seasons, no, no. That’s mere child’s play to the purchasing power I’m packing. I have come out of stores before with three of the same skirt, in the same color. I could go four months without doing a single load of laundry, not even for unmentionables. However, the saddest thing about this majestic trousseau is that it’s 98% black, or navy, or an inky blend of the two. While this, how shall I say… classic palette makes for easy outfitting, it also makes for extended periods of CAD: Clothing Affective Depression. Something needed to change, but I was running out of options to brighten my outfit, let alone outlook. Having the normal bank account (or lack there of) of a college student, I couldn’t just drop loads of cash for the cute tea dresses and seersucker Peter Pan collars that flooded the pages of my magazine subscriptions. It was only until I was looking at the brightly hued salad bar in the dining hall that I was struck with inspiration: if we are what we eat, then I’m going to be a parfait. Parfaits have to be the ultimate springtime sweet, not to mention mood-lifter. For me, they fall under the “whimsical foods” category, which includes other pastel perfections like macarons, crepes, brie, and champagne. Coincidentally, these are also all French but that’ll be an exploration for another day. And while dining halls are sometimes not the most creative spaces, most have the ingredients needed for the perfect stacked snack. My first piece of advice is to get creative; sometimes the best combinations are those first overlooked, and dining halls are packed with tons of options. Another thing worth noting? A parfait doesn’t have to be sweet. While it’s normally made with fruit and a type of dairy, I’ve also attempted a taco parfait and even a pizza parfait. The possibilities are literally endless. However, this recipe below is not only delicious, easy to make, and incorporates spring produce, but it makes the trendiest of accessories to accompany your little black dress, or little black sweater, or little black anything, in my case. Anna Wintour, eat your heart out… literally. 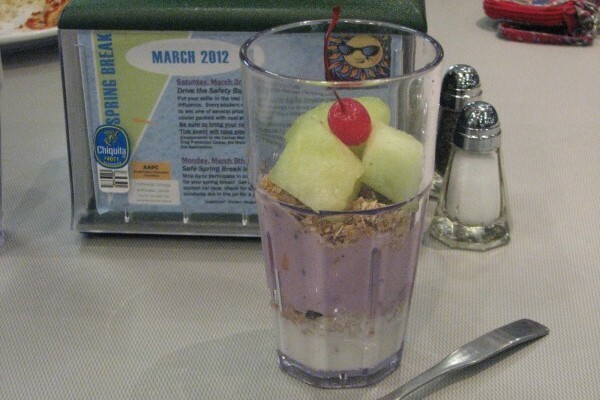 Starting from the bottom, layer vanilla yogurt, granola, cantelope, blueberry yogurt, a bit more granola, and honeydew. Garnish with a particularly pretty maraschino cherry, and enjoy! What a fun post, I love the fashion-food-color connection! And of course I do love a good parfait.